Hi, I am interested in your 1979 Chevrolet C/K Truck (stock #1199-NSH) listed on Autotrader for $23,995. I'd like to get more information about this vehicle and confirm its availability. Its hard to beat a third generation Chevy stepside 4x4. With a 14-year model run with just incremental updates, even Chevy seemed to agree with that statement. 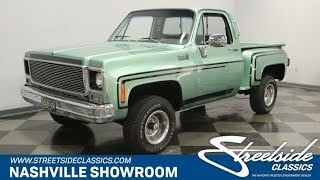 Check out this good-looking example with several nice upgrades and see if it might be just the truck you have been looking for. Presented in a unique shade of Green metallic paint with custom black stripes really differentiates this truck from all the others you will see on the road. The paint has a nice shine to it and reflects the light off the body lines, especially at night as you cruise down the road. Up front, a billet grill surrounded by chrome and underlined by a simple chrome bumper leads the way with a nice clean look. The centerline and leading edge of the hood starts the stripe treatment off. Down the sides it traces the body line of the fender and door as well as catching the fender well lip and extending down the rocker. Chevrolet in script appears in the stripes on the rear fenders and the tailgate finishes off the sharp looking job underlined by a black diamond plate bumper. The bed looks awesome with nicely finished wood and black rails. Open the door and you will find a black interior that is basically stock but with a couple nice touches. The door panels have a patterned upper section with a big armrest that is nice for long-distance cruising. There is also a speaker set into the lower section that pumps the sounds out from the aftermarket stereo that is AM/FM/CD and iPod compatible. There is a two spoke steering wheel with a bowtie horn button and the shifter for the automatic transmission. The dash is a simple but effective layout with the speedometer and tach directly in front of the driver and gauges for fuel, water temp, oil pressure and voltage clearly visible off to the left. Custom wood trim dresses out the right side of the dash and surrounds the transfer case shifter while providing a place to set a few things on top of it. The bench seat has a new cover on it and there is a sliding glass window into the bed. Pop the hood and you will find healthy 350 cubic inch motor set down in a neat and clean engine bay. A chrome Chevrolet air cleaner assembly sits on top of a Holley 4-barrel carburetor and an Edelbrock intake manifold. There are finned aluminum valve covers that along with the intake and block are painted blue. Long tube headers are heat wrapped and lead out to dual Flowmaster mufflers. Signs of good routine maintenance include newer belts and hoses and a new fan shroud. Power flows out through a 3-speed automatic transmission, through the transfer case and out to solid axles front and rear mounted on leaf springs. There are a fresh set of shocks in the rear while up front power steering works with a beefy sway bar to offer good maneuverability in parking lots and good handling on the road. Power front disc brakes provide the stopping power and the rubber meets the road, or the dirt, through 235/75R15 Firestone Destination tires mounted on steel wheels with trim rings. Come on down and check out this sharp looking stepside pickup. It might be just the truck you are looking for.